After an indulgent trip to Melbourne last week, tasting from lemon, lime and bitters dessert featured on Masterchef to tapas at the Gazi restaurant, I had a sudden craving of vegetables packed meal at home. Do you feel the same way after returning from a trip? 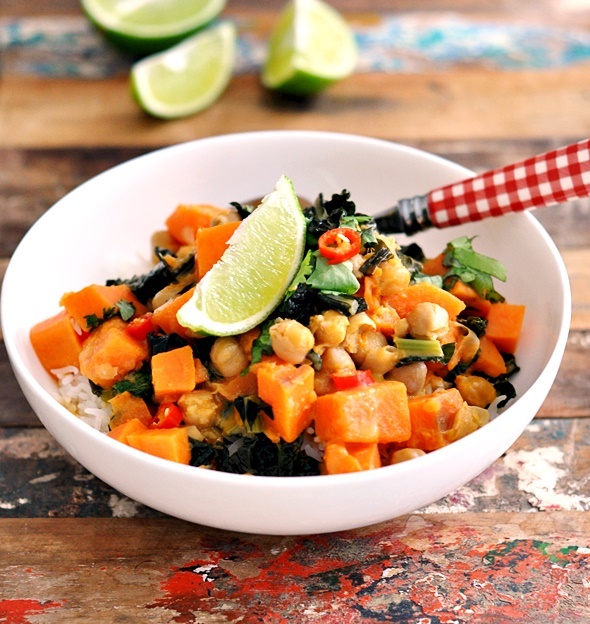 Inspired by Crepes of Wrath’s green chickpea and chicken coconut curry with swiss chard, I’ve made a meat free version with sweet potato, chickpea and cavolo nero (a lot of it!!). A girl has to make the full of kale season right? 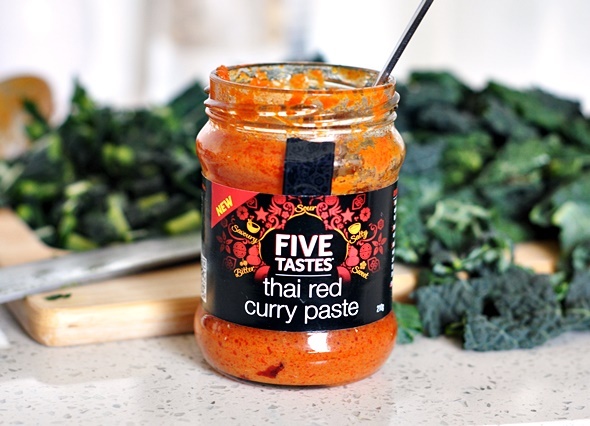 Thanks to the complex concoction of aromatics in Thai red curry paste, this vegetable packed dish is not shy on flavour! Coming home to a bowl of steaming hot rice drenched in spiced coconut broth was simply comforting especially during this time of the year in Orange. 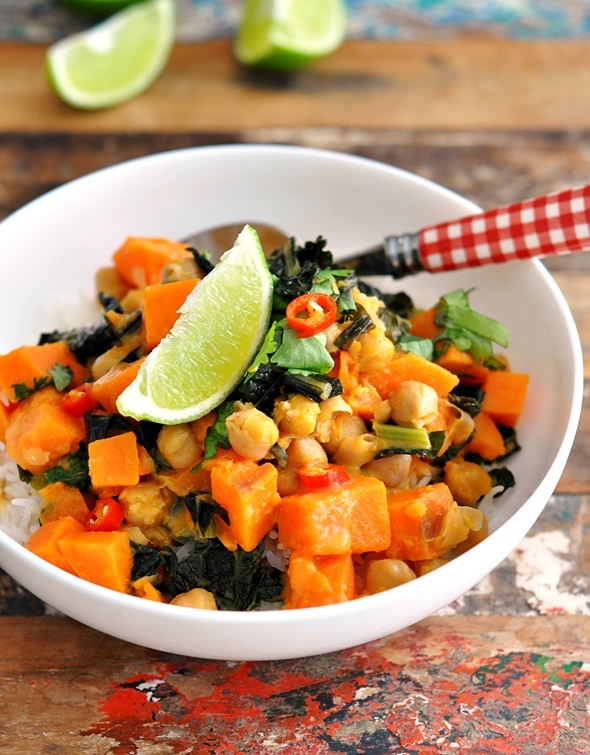 There’s no words for a quick and easy meal like this! Whenever I make Thai curry, garnishes such as fresh coriander leaves as well as thinly sliced bird’s eye chillies are a must. If you really want to take the freshness to the next level, a freshly squeeze lime juice will do the trick! Enjoy! In a 3-litres pot, add peanut oil and Thai red curry paste. Cook over low heat. 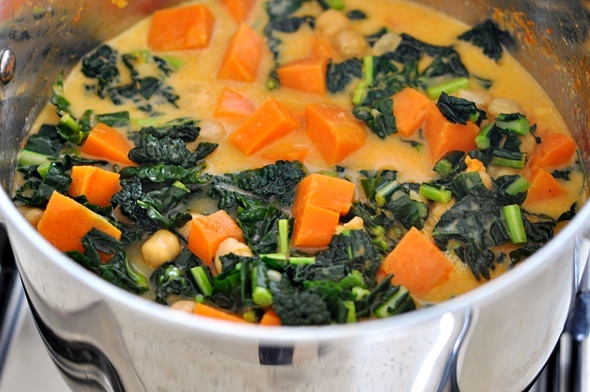 When the paste starts to sizzle and becomes aromatic, add sweet potato. Toss to coat the sweet potato evenly. 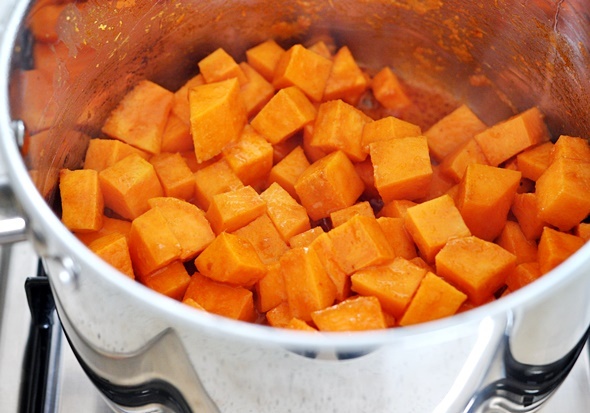 Add about 1/4 cup water to help softening the sweet potato. Allow the sweet potato to cook for a couple of minute, covered with a lid, until slightly softened. 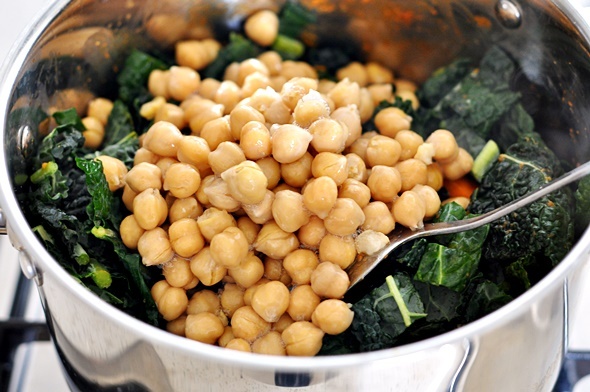 Add cavolo nero and chickpeas. Toss to evenly coat with the spices. Add coconut milk and an equal amount of water. Add little more water to ensure all the vegetables are submerged in the broth. Cover with a lid and cook over low-medium heat until the sweet potato cubes are fluffy and softened when pricked with a fork. Check for taste. Season with tamari, light soy sauce or fish sauce, depending on your dietary requirement. For additional sweetness, add brown sugar to taste. Once you're happy with the seasonings, the curry is ready serve. Just before serving, garnish with chopped fresh coriander leaves, sliced chilli and lime wedges. Serve immediately with rice. Don’t forget to subscribe to Fuss Free Cooking for regular meal inspirations delivered straight to your inbox!